Hurrah for the guy who poured the water!! I got shot down over N Vietnam in 1967, a Sqdn. Commander. After I returned in 1973….I published 2 books that dealt a lot with “real torture” in Hanoi. Our make-believe president is branding our country as a bunch of torturers when he has no idea what torture is. As for me, I was put thru a mock execution because I would not respond…Pistol whipped on the head….same event.. Couple of days later… hung by my feet all day. I escaped and a couple of weeks later, I got shot and recaptured. Shot was OK…what happened afterwards was not. They marched me to Vinh…put me in the rope trick, trick…almost pulled my arms out of the sockets. Beat me on the head with a little wooden rod until my eyes were swelled shut, and my un-shot, unbroken hand a pulp. Next day hung me by the arms….re-broke my right wrist…wiped out the nerves in my arms that control the hands….rolled my fingers up into a ball. Only left the slightest movement of my L forefinger. so I started answering with some incredible lies. Sent me to Hanoi strapped to a barrel of gas in the back of a truck. Hanoi ..on my knees….rope trick again. Beaten by a big fool. Into leg irons on a bed in Heartbreak Hotel. Much kneeling–hands up at Zoo. Really bad beating for refusing to condemn Lyndon Johnson. Several more kneeling events. I could see my knee bone thru kneeling holes. There was an escape from the annex to the Zoo. I was the Senior officer of a large building because of escape…they started a mass torture of all commanders. I think it was July 7, 1969..they started beating me with a car fan belt. In first 2 days I took over 300 strokes…then stopped counting because I never thought I would live thru it. They continued day-night torture to get me to confess to a non-existent part in the escape. This went on for at least 3 days. On my knees… fan belting…cut open my ******* with fan belt stroke. Opened up both knee holes again. My fanny looked like hamburger..I could not lie on my back. They tortured me into admitting that I was in on the escape…and that my 2 room-mates knew about it. The next day I denied the lie. They commenced torturing me again with 3- 6- or 9 strokes of the fan belt every day from about July 11 or 12th..to 14 October 1969. I continued to refuse to lie about my roommates again. Now, the point of this is that our make-believe president has declared to the world that we (U.S..) are a bunch of torturers…Thus it will be OK to torture us next time when they catch us…because that is what the U.S does. Our make-believe president is a know nothing fool who thinks that pouring a little water on someone’s face, or hanging a pair of women’s pants over an Arabs head is TORTURE. He is a meathead. I just talked to MOH holder Leo Thorsness, who was also in my squadron, in jail…as was John McCain…and we agree that McCain does not speak for the POW group when he claims that Al Gharib was torture…or that “water boarding” is torture. Our president and those fools around him who keep bad mouthing our great country are a disgrace to the United States. Please pass this info on to Sean Hannity. He is free to use it to point out the stupidity of the claims that water boarding…which has no after effect…is torture. If it got the Arab to cough up the story about how he planned the attack on the twin towers in NYC … Hurrah for the guy who poured the water!! George Everett ” Bud ” Day(born February 24, 1925) is a retired U.S. Air Force Colonel and Command Pilot who served during the Vietnam War. 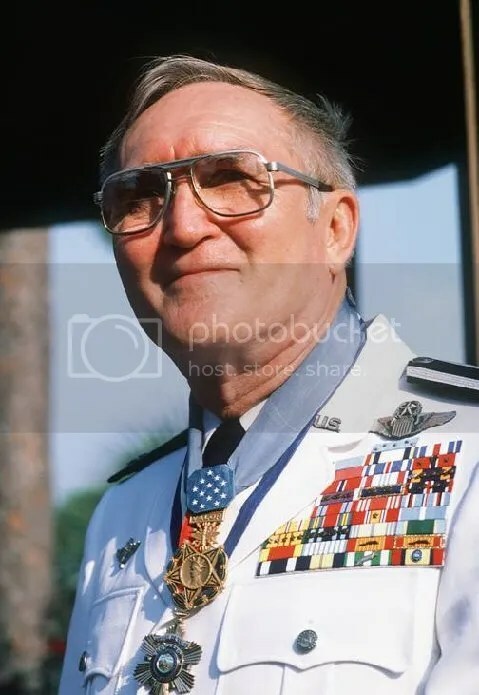 He is often cited as being the most decorated U.S. Service member since General Douglas MacArthur, having received some seventy decorations, a majority for actions in combat. Day is a recipient of the Medal of Honor. “The Medal of Honor is the highest award for bravery that can be given to any individual in the United States of America. Conceived in the early 1860’s and first presented in 1863, the medal has a colorful and inspiring history which has culminated in the standards applied today for awarding this respected honor. He got the medal with the help of Admiral McCain of USS Liberty infamy, some say because of blackmail. I have no proof of that. Then there is John McCain. Colonel Ted Guy, his POW commanding officer demanded he be tried for treason. Instead, McCain got a dozen medals and a Presidential Pardon which few know about. McCain made 32 propaganda broadcasts while a POW, asking for US troops to surrender, accused the US of war crimes, talked to foreign journalists, was debriefed by Russian KGB and openly admits to training North Vietnamese anti-aircraft gunners and aiding them in positioning their weapons. US Army Colonel Earl Hopper (deceased) estimates that 60 American planes were shot down because of McCain. During McCain’s entire career in politics, he has worked against POW families, assisted North Vietnam in hiding evidence of POWs alive, according to a statement from our Chief POW recovery officers in Thailand, a high ranking Special Forces Intelligence Officer and long time friend and co-worker. McCain still talks of his own heroism yet those who were there to witness it said he was a collaborator and traitor. Who do you believe? Fellow POW’s say John McCain Was a Coward and a Traitor in Viet Nam. a totally fake “president” so why not a totally fake MOH awardee?